Theo, eyebrows bridged by a crease of concentration, waved her fingers midair in a seeming random pattern. When she finished, Sela gasped. The glowing trails coalesced to clearly show a portrait of their mother. The image sparkled before disappearing. “The night Mom died,” Theo whispered. Sela sat up straight, fists balled in her lap. Fear gathered in her throat but she shook her head and swallowed it. “He’ll have to go through me first,” she growled. The air shimmered and the eyes of both girls widened. They clasped hands and bowed their heads, thanking the goddess and their mother’s spirit. Two would now stand strong against the blindly bigoted theocracy headed by their maniacal patriarch. 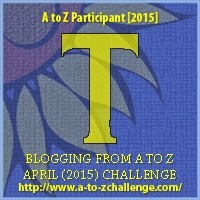 This entry was posted in Blog and tagged #atozchallenge, Darla, Flash Fiction. Bookmark the permalink. Thanks for visiting. Those few paragraphs had me wanting more of this story. Heh. Best of luck on A-Z. When I started I thought it would be fun and would improve my blog number. It did neither so I stopped at Q. So close but so far away. I almost got ticked at Noony for not sharing this with me sooner- way to go,deff want to read more, chica! I'm sorry it didn't work out for you, Cathy. For me, the challenge is my personal goal. ~hugs~ Best wishes. I hope you still enjoy writing and blogging. That's so kind of you to say, Rachel. This was just something that came to mind when I looked up the letter T in my thesaurus. ~grin~ Maybe I'll do something with these characters, though. And there is no time like the present!